Cycling in Europe: What a difference 5 km can make. 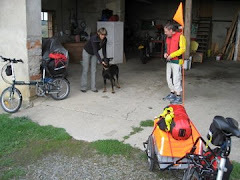 We are planning to cycle to Basel (Basle, Bâle) as soon as it stops raining. Once we are there we will need return by rail to Viernheim. Basel has three railway stations, belonging to three different organisations: Basel SBB, the Swiss station, Basel Badischer Bahnhof, the German station and Bâle SNCF, the French station. The platforms of the latter two are legally German or French, but the buildings themselves including ticket offices etc. are on Swiss soil. This means if you pay by credit or debit card that the tickets will be slightly more expensive. However what amazed me was the price difference between travelling from Basel SBB and Basel Bad to Mannheim. As long as you are prepared to travel on regional trains fairly slowly the trip between Basel Bad and Mannheim costs 29 Euro for up to five people plus 4.50 Euro per bike for the bicycles, i.e. 38 Euro in our case. Travelling between Basel SBB and Mannheim via Basel Bad will cost you 63.30 Euro plus ten Euros/bike for an International bicycle ticket, i.e. well over twice as much. The five minute ride from Basel SBB to Basel Bad will cost over 40 Euro.